Walking back to the Skytrain station with my Thai tutor Thursday afternoon, I was commenting (in Thai, of course) about how much the area around the intersection of Sukhumvit Road and Soi 21 has changed in the four years since I moved here. 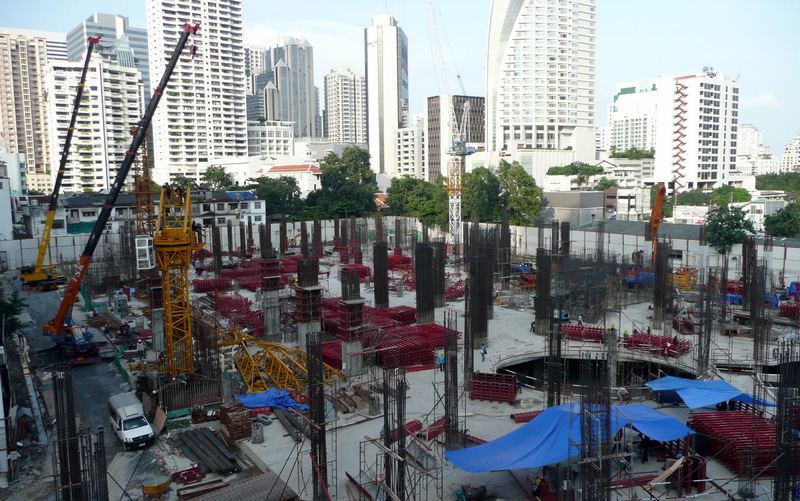 There are a few new buildings and another large development called Terminal 21 is now rising next to the Asoke Skytrain station. The site as it currently appears, looking to the northeast from the east-bound Skytrain platform. 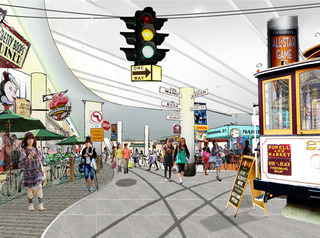 Artist’s interpretation of Terminal 21’s design. This is looking roughly west. The above picture of the construction site would have been taken from the end of the Skytrain platform, which appears to the left of the face billboard in this representation of the building. Built on the site of a former Ford and Volvo dealership, this very large property is one of the best-located in the city. Described on its website as an “airport terminal” design (whatever that means), it will feature a 9-storey mall including an SF Cinema and a supermarket, a 20-storey serviced apartment complex, 145,000 square meters of office space, and 40,000 square meters of retail space. Each floor of the mall will be themed on a different city or region of the world. The bottom floor will be the Caribbean and then we will proceed through Rome, Paris, Tokyo, London, Istanbul, San Francisco (which occupies two floors) and Los Angeles. San Francisco floor, left, and Istanbul floor, right. Each floor will focus on a particular type of shop – fashion brand names on the Paris floor, food and restaurants on the San Francisco floors and the cinema will be on the Los Angeles floor. Istanbul’s floor will have fashion accessories and leather goods. Yes, I know what you are thinking. Do we really need another mall in this city? The answer is, definitely not. I think we need more mixed income housing located right next to transit. But that isn’t going to happen anytime soon. In the meantime, I’ll enjoy the fact that this is a great location – very transit-friendly as it is located at the intersection of the Skytrain and subway lines – and developments adjacent to transit are generally good for the city. Plus, alternatives to having to go all the way down to Siam Square and Paragon are always welcome. 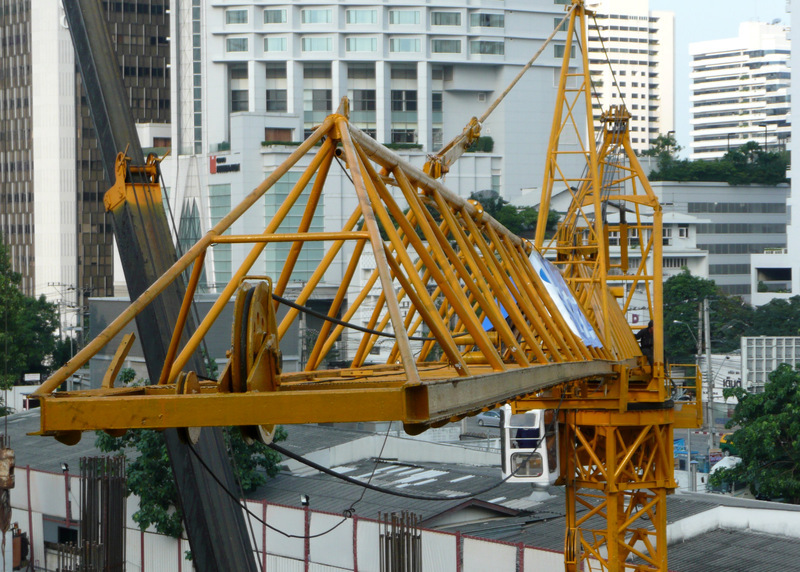 As the cranes are being installed, they are right at eye level with the Skytrain station’s platform. Nice views. 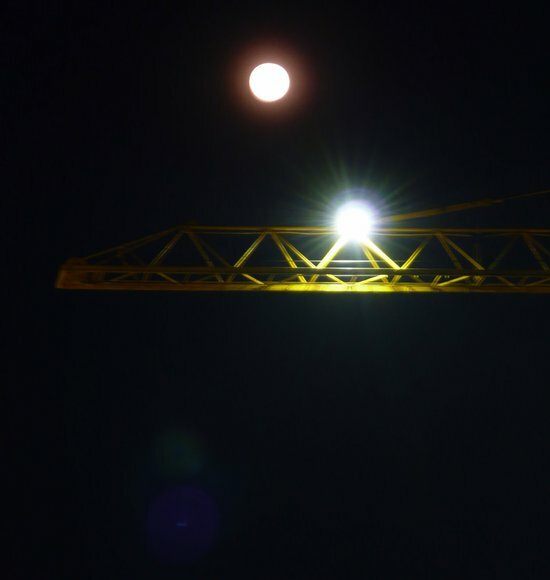 Nighttime shot of the construction taken on Monday, November 2nd. This is the night of Loi Krathong. Can you spot the full moon? Stay tuned for more updates as I follow the construction of Terminal 21. This entry was posted in Uncategorized and tagged Bangkok, Construction, Krungthep, Terminal 21, Thailand, Urban Development by christao408. Bookmark the permalink. A 9 story mall??? That’s huge. I’ll look forward to seeing more about the construction! 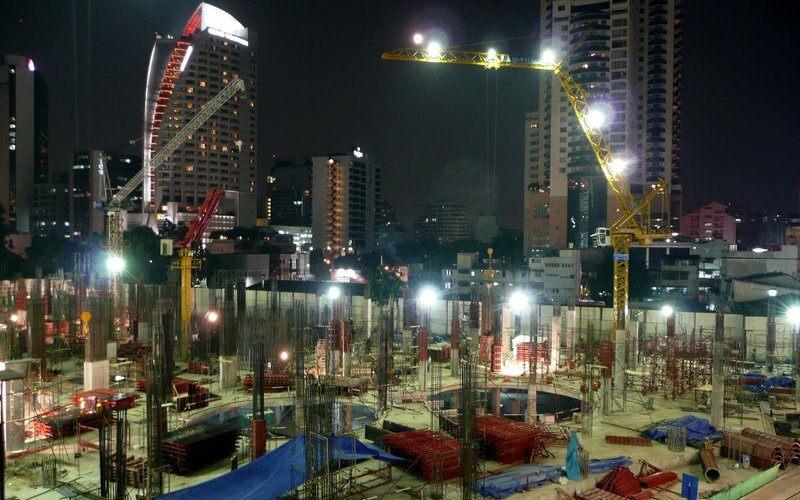 It’s near the Asoke staion, which is kinda towards the south of Sukumvit Road….looking forward to such a modern development! I think they should consider developing the site into a mid-entry level housing project. It looks nice. A 9 floor mall is huge!!! I hope the mall will be able to enrich the inner fabric of the city and the quality of life. I doubt it though. Maybe they can have some social services inside the mall. 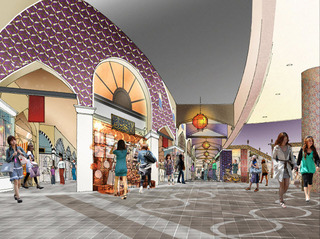 It looks interesting although the shopping experience would be more of a “Las Vegas world showcase” than the usual single theme mall. I’m assuming Thais have less issues exploring 9 floors of stores as the upper floors in a mall or store tend to get less traffic. 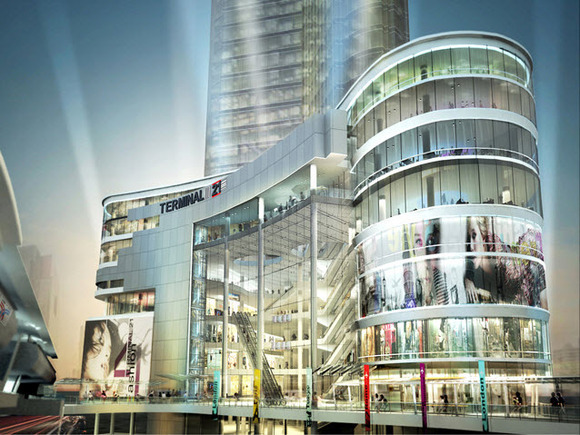 @TheLatinObserver – Cinema, food court and fitness center are at the top, drawing traffic up. Elevators will be relatively difficult to find, encouraging use of escalators. Should help get traffic to floors that might otherwise be overlooked. @TheCheshireGrins – I know someone whose office is at the adjacent Westin hotel. Should see if I can use that connection to get a picture from their roof of the construction site so you can see where it is relative to the stations and the streets. @CurryPuffy – Hmm… I always think of Sukhumit at east-west. Guess I need to pull out a map and re-orient myself. @yang1815 – We’ll see…@murisopsis – @kenpcho – Excactly, nice to see some construction underway but wish it was for something a bit more needed than another mall. Although, truth be told, if it can shift the epicenter away from the Siam Square area, it wil be good for traffic flow, both on the transit system and the roads. @ElusiveWords – Would you believe that about four years ago when the Paragon Mall opened (adjacent to a royal temple, nonetheless) there was a whole discussion about the declne of morality in society, consumerism, etc. and there were some serious proposals that maybe the temples should open some Dharma education centers in the malls themselves. Lovely, optimistic, wide-eyed suggestions…@agmhkg – Define “on-time”… ha ha ha…@Dezinerdreams – You know, at first the number didn’t capture my attention but now that you mention it, nine stories is quite big. One thing worth noting is that this mall is with walking distance (or one station on the Skytrain) of the Nana area, which is one of the larger (and scuzzier) tourist areas. It will also be pretty easily accessible to the Airport Express line which opens soon. This could give it the chance to be a good success. Two floors for San Francisco! That’s pretty impressive for a city of 700,000. I wonder if there’ll be a Castro section of one of the San Francisco floors. This reminds me of a crossbreed between Las Vegas and the SF Metreon for some reason. @chow@ireallylikefood – Pretty apt description based on the drawings and website. 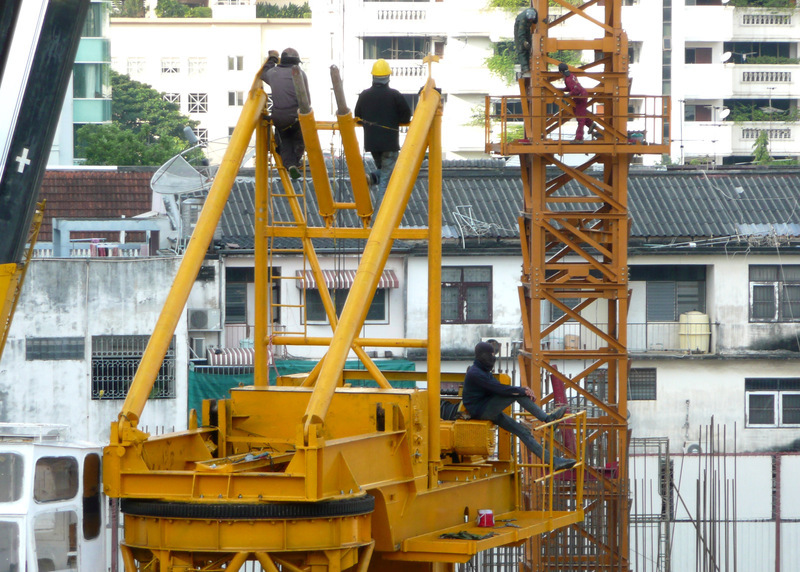 @mistifarang – I’ve been watching now about once a week, seeing how they get the finishing work done and particularly how they build the connections to the Skytrain and MRTA. Interesting photos you’ve taken. Thanks for the link.